Def: Hippo is an acronym standing for HIghest Paid Person’s Opinion. This term was coined by Avinash Kaushik, analytics genius. When you are in a meeting and trying to get some decisions made, look around. Who is the person who gets to make the final call? They are your Hippo. It is crucial that you get this person to support your project and decisions. Here is one technique that I advocate, and it’s quite simple. You can’t decide everything. Don’t try to give your opinion for everything. You need to decide what really matters to you and what doesn’t. Everything that falls below the bar, you want to get the Hippo to decide. Get the Hippo to decide every possible decision that doesn’t matter. What this does is gets the Hippos fingerprints on the design. Cognitive dissonance is a psychological process where people do everything they can to avoid the idea that they are wrong or made a bad decision. (It’s more than that, but for this idea, it works fine). If you can get the Hippo to put their fingerprints on the project in the beginning, they will support it at the end and take some personal interest in it’s success. Whether you are in a startup or a big company, there are always Hippos who are trying to get their fingerprints on the design. You have to let them, but pick your battles. Decide where you want to lay on the tracks and where you will give in. By this, I mean, a decision costs you chips, like poker chips. If you get your way, you pay the other party some chips. If they get their way, they pay you. By doing a good job, you build up some chips and doing a bad job you lose some. Of course, the Hippo has lost of chips, so he/she is at a disadvantage. Don’t waste your chips on meaningless decisions. In my last big project, I found that the decisions and feedback from the HIPPO was far more useful and helpful than not. I didn’t need to burn chips because I didn’t need to fight the HIPPO. So, just to mirror this back, you should avoid trying to turn a challenging situation into a better one. You should just find a new job, find a new spouse, find a new location, find a new house, find a new car, find a new whatever isn’t perfect. Or are you saying that one should be happy with whatever they have and stop whining about? Either way, I think you are saying, Don’t ever try to improve your circumstances. Either stop complaining or leave. Love it or leave it. I guess I have a different philosophy. I believe you can love it and evolve it. 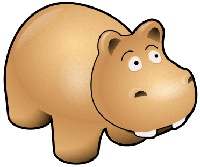 Actually, what I was challenging was the assumption that the HIPPO is going to cause conflict and that he/she is going to offer suggestions that you will necessarily need to defend against. I believe in the power of creative collaboration over that of the lone genius. The HIPPO is a part of the process, not an adversary.